Tweets about a possible deal with China and expectations for the cancellation of Brexit lifted Sunday futures. President Trump tweeted that he had a nice phone conversation with President Xi and the trade deal with China was proceeding nicely. Chinese officials confirmed in their own statements that a deal with the US was progressing. US investors will be celebrating if this comes to pass. China is reportedly considering a law to ban forced tech transfers. That is the process of forcing foreign businesses to transfer technology to local firms in order to do business in China. China has long maintained that these transfers are against policy, but they continue anyway. By implementing a law with penalties, they would make it easier for a lot of companies to open up shop in China and that is a major point in President Trump's trade plan. Meanwhile British Trade Minister Liam Fox, a proponent of leaving the EU, now says that Brexit only has a 50:50 chance happening. He said there is a strong possibility the deal could be halted if parliament rejects the government's divorce deal with the European Union next month. The UK is scheduled to exit the EU on March 29th but the deal they have spent 2 years on trying to work out the details has fallen apart. Lawmakers are scheduled to vote on the deal on January 14th and odds are good it will fail. Killing Brexit would remove a lot of economic uncertainty surrounding the process. Going through with a bad deal could drag out the pain for years to come and send multiple countries into recession. The market could celebrate the cancellation of Brexit. These two events have lifted the S&P futures by 20 points on Sunday evening. With volume on Monday expected to be light, there is a good chance of a gap and crap where the market moves higher at the open and then fades into the close. The S&P plunged last Monday to close at 2351.10 a drop of 579.65 points and -19.78% below the September 20th high close at 2930.75. Technically the long running bull market is still alive by the smallest of margins of 6.45 points. 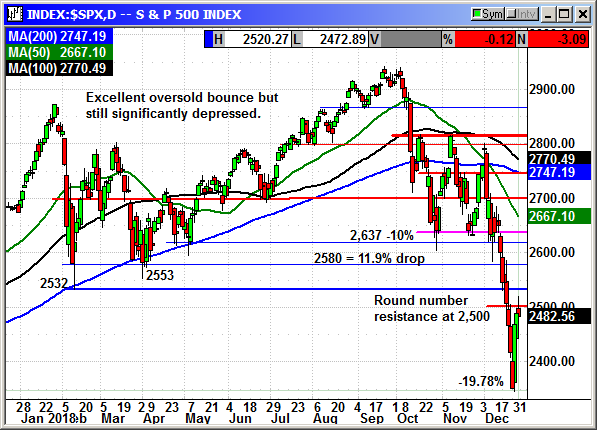 The rebound was impressive with Friday's intraday high of 2,520, a 169-point recovery from Monday's low close. However, the market was the most oversold since the financial crisis and it was due for a monster bounce. The critical piece of the puzzle is what comes next. The Dow and S&P are on track for their worst December since 1931. That suggests we should see a continued rebound in January but not necessarily straight up. Over the last 13 bear markets with a 20% decline or more in the S&P, the market continued an average of 8% lower after reaching that 20% mark. Just because we missed it by 6.44 points does not mean we are not in a bear market. That is close enough. The average rebound after a bear market low is 14% in the year that follows. Looking back, we can easily spot the causes of the decline and decide how much impact those events will have on the rebound. The biggest problem was the Fed's hawkish language over the last two months and the Powell claim that the Quantitative Tightening (QT) was on "autopilot" for another $600 billion in 2019 and the equivalent of three additional rate hikes. Powell also said the Fed was planning on two regular hikes in 2019. That sent the market into a dive. Adding to the problem was the constant twitter attacks on Powell by the president. In addition, the resignation of Mattis, the impending government shutdown and Mnuchin's calls to the banks all weighed on market sentiment. The only one of those events likely to continue to be a cloud over the market is Fedspeak. Until Powell lightens up on the rhetoric there will be continued worries. The government shutdown, Mattis termination, Syria pull out, Mnuchin, etc, are now old news. They should have no further impact. The sharp selloff in December caused further selling. As I have said many times selling begets selling. The severity of the losses caused a strong wave of tax loss selling in a short period of time that pushed the market to its lows. That is now over. There may be another cycle in early January as those holdouts waiting for the arrival of a new tax year decide to take their losses. For one reason or another they held off taking additional losses in 2018 and will hit the sell button in early 2019. These should be brief, and any dip should be bought. There are billions of dollars sitting in accounts of portfolio managers as a result of the tax loss selling and stop losses getting hit in the crash. They will want to put that money back to work as early in January as possible in order to profit from any earnings generated rebound and the current low stock prices. As companies begin reporting earnings on January 14th, they will also be announcing new stock buyback programs. With equity prices so low they can get more bang for their buck with an accelerated program. That will also serve to lift the market. Once it is clear the bottom is behind us the cautious investors will begin to come back into the market. That could provide the longer-term uptrend we are expecting for Q1. I was with a high net worth investor on Christmas Eve. After that drop he called his broker and moved 50% of his assets to cash. I thanked him for his capitulation because it probably meant a large number of likeminded investors did the same thing. That typically signals the bottom in the market . The S&P fell 16% since December 3rd or -449 points. 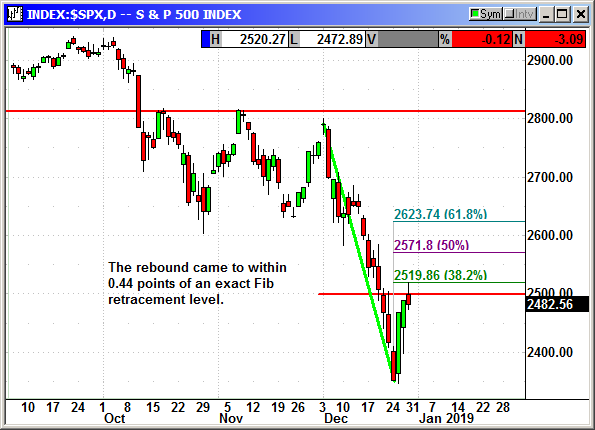 In any normal rebound a 25-38% retracement should be expected before profit taking begins again and we face the potential for another decline. The intraday high on Friday came within 0.44 points of a dead stop on that Fib retracement level. This is exactly where it should have stopped. In a normal chart not influenced by EOY calendar implications, we should expect a minor retracement of some of those gains. We could get that from any early January tax loss selling. In a normal market we could also expect a retest of the lows. I believe the calendar issues will prevent that complete retest although we could see some early January weakness. The Dow rose to +243 intraday and the low was -155. The high came around 2:30 and sellers appeared just before the close. It could have been profit taking, weekend event risk or simply closing the books for the year. The Dow rebounded 1,340 points from Monday's low with the biggest single day gain ever at 1,086 points on Wednesday. 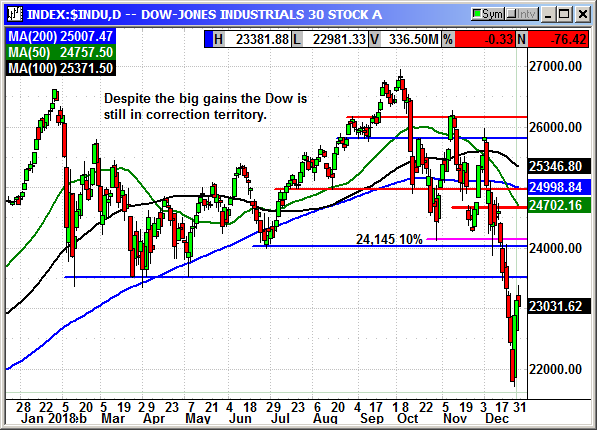 There are multiple short-term resistance levels at 23,500, 24,150 and 24,800. The range on Friday had a little something for everyone and volume was strong at 8.1 billion shares. Advancers were almost 2:1 over decliners. Dow stocks were a little worse, but the losses were minimal. Friday was a pause to reflect after the rebound smoke cleared. 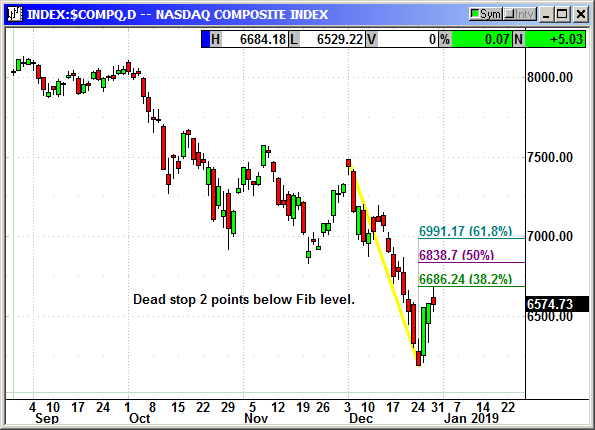 The Nasdaq rebounded almost 400 points from the low and came to a dead stop 2 points below the Fib retracement level at 6,686. For it to stop at the same relative level as the S&P is not a coincidence. Technical analysis does matter, and it is used in trading. Google was the biggest loser of the big caps and Tesla the biggest winner. Amazon has been a leader after they bragged of a record holiday season. Amazon said "tens of millions" customers started new Prime subscriptions. They shipped more than one billion items with free shipping on Prime. Shares rose 205 points from Monday's low to Friday's high. 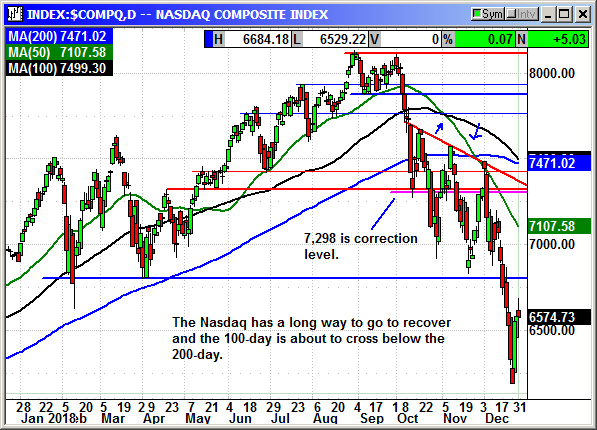 The Nasdaq is still very oversold and could easily rally 1,000 points and only reach December's high at 7,486. It could be a long time before we see the old August highs retested again. 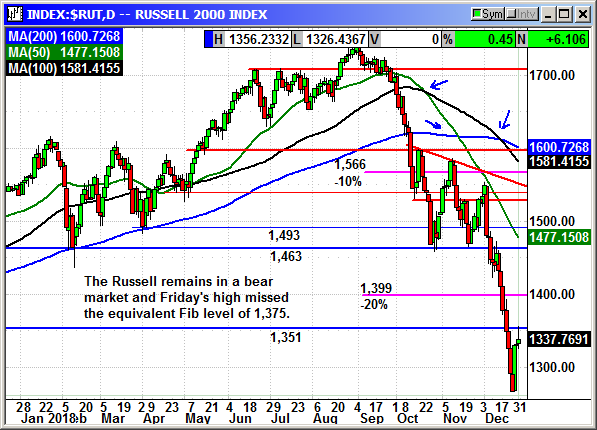 The Russell remains in a bear market and did not come close to the same relative Fib level at 1,375. Small caps are trying but they do not have any investor confidence at this point. They are still in a downtrend until the index moves well above 1,500. 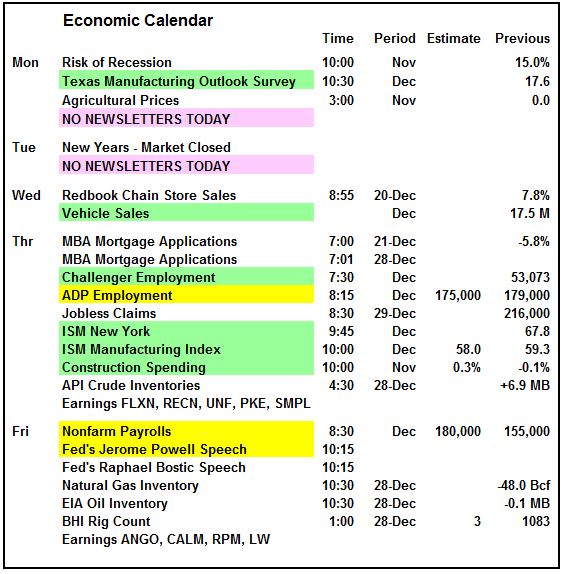 This is payroll week with the ADP Employment, Challenger Employment report and the Nonfarm Payrolls. No material change is expected with new jobs in the 175,000-180,000 range. Fed Chairman Jerome Powell will speak on Friday and that could be the highlight for the week if he uses a more dovish tone. He has been a negative for the market for several months now. The ISM Manufacturing Index on Thursday will be an important read on the national manufacturing sector. There are no material earnings next week. To summarize my earlier comments, we could see some early January weakness, but I would expect it to be brief. Earnings begin in two weeks and they are expected to be good. Companies will be updating guidance for 2019 and announcing additional stock buybacks. I would look to buy any early January dips. ONLY ONE TRADING DAY LEFT IN 2018! Don't forget to reward yourself with our 2018 End-of-Year Annual Subscription Sale! You’ll save significantly when you renew now. 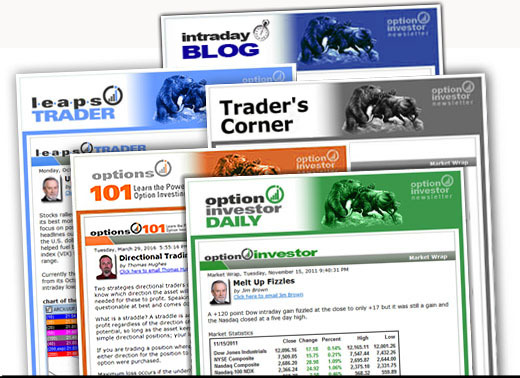 The options market isn’t waiting for you. And you shouldn’t wait to keep Option Investor coming at the lowest prices you’ll see for at least a year! There isn’t a minute to spare.